Top Ten Tuesday topic is a meme hosted by The Broke and the Bookish. Today’s topic was Top 10 Contemporary Books That Would Be Great Paired With A Required Reading Book OR Top Ten Books That You Wish Were Taught In Schools. Even though these are both great topics, I struggled with coming up with ten, and decided to focus on the books I wish I had read in school. Some people have read these for school, but every curriculum is different, and these are ones I wish I had been assigned to read (especially in place of some of my least favorites). This week’s list is separated by category. Classics are intimidating, which is why they make us read them in school, right? Because otherwise, we might not pick them up. Or are we intimidated by them because they were required reading in school? Hmmm… Regardless, they can’t make us read them all, because there are so many of them! But some I kind of wanted to read, or want to read now, but I might be intimidated for one reason or another, or just haven’t gotten around to it for one reason or another. Great list- I think some school districts are listing The Book Thief as required summer reading- I want my kids to read it. That’s good! Glad it’s catching on in schools now! I know, it has a way of doing that! Finally someone else who hated Heart of Darkness! That was the worst book in my entire college experience. And I highly recommend that you read The Screwtape Letters – it changed my entire perspective on life. Ugh, yes, I had to read it for AP English my senior year of high school and it was torture. I really do intend to read The Screwtape Letters in full sometime; I have many excerpts from it and it is eye-opening for sure. You know, I often think “I wish I’d read that book in high school,” but then I think back to high school and realize I might still have opted NOT to read those books anyway, lol. Although The Bell Jar, Fahrenheit 451, and Brave New World might have been interesting enough to hook me back then. I’ve had The Screwtape Letters on my TBR for years now, ever since a pastry classmate recommended it, but who knows if I’ll ever get around to it. The Giver and Ender’s Game and two of the very few assigned books I actually read. They’re also two of my favorites. My English teacher senior year loved Ayn Rand, but for some reason she never assigned any of her books for us to read. I would have LOVED to have been assigned books like Cinder or The Hunger Games in high school! Sadly, I have a feeling I may have skipped The Book Thief as a teenager, but I’m so glad I read it as an adult. Great list, Amy! That is true, that I might have opted out of reading something (since sometimes I had a list of choices) or that I may not have appreciated the book the same way. That is the downside of having 14 year olds read classics… it may not mean the same thing to them that it will 10 or 20 years later, heck, it doesn’t even have to be a classic. Sometimes life experience changes your perception on these sorts of things. Yes, exactly right! I don’t think The Giver would have touched me as deeply if I’d read it as an adult, compared to reading it at like 12 (although I did read it again recently and still enjoyed it). Life + books are interesting that way. Ooooh great list! I’m not huge for the classics, so I can’t say I’d be jumping at those. But, I definitely wish books like Cinder and The Book Thief assigned for school. Such great books, and I’m sure they could really make some teens fall in love with reading if they didn’t love it already! Classics are really hit or miss for me. Other than The Screwtape Letters (which I have read many excerpts of so I feel confident I would like it), I can only assume I would like the books I mentioned in that category, because I really might not. After all, I thought I would like 1984, THE classic dystopia, but then found it mostly (but not completely) disappointing. But yes, newer novels with the potential to become “new” classics I think would be great for teens to help foster a love for reading! I haven’t read any of those classics either. I do like reading those in class so that I have peers to discuss them with. I loved reading Ender’s Game in class. It was nice to read a sci-fi. 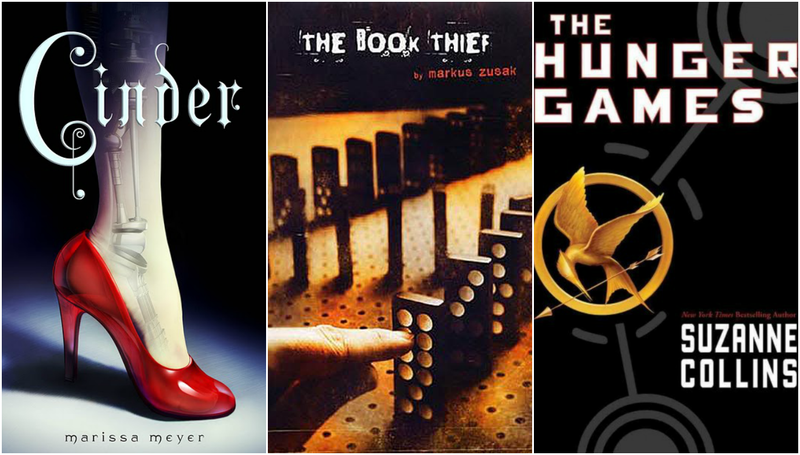 So I still haven’t gotten around to reading The Book Thief (one of these days I will), but Cinder and The Hunger Games would be great choices to add to some assigned reading. I could really see The Hunger Games being taught in schools, and think it would be a great choice. Hopefully it could encourage teens to read more if they know that books like it exist. My cousin-in-law, who is 16, did read The Hunger Games for school a couple of years ago, so I guess some of them are doing it now. Also I hated “Heart of Darkness” the first time I read it…but then I had to read it again for another class. I still didn’t like it. But then I had to read it yet again (my memory is terrible, so yes, I had to reread it every time it was assigned. Sadness. ), and the third time around I really started to appreciate it. Strange, huh? I wouldn’t say it’s my favorite story ever, but I have to admit that now I like it. Interesting. Sometimes rereads and life changes can do that to us but wow, three times! I have read some Ayn Rand and really wasn’t a huge fan. I think the issue was that I hammered out the entirety of “The Fountainhead” in about a week in order to write an essay for a scholarship that I ended up not getting. I haven’t been able to bring myself to read her since, but I can see why it would make for good school reading. Anthem is the only thing I have read by her and it’s a novella, so it’s short and gets to the point. I think someone else I know may have also not been fond of Fountainhead. I can see how that scholarship essay could embitter you! I imagine it does mess with your head! Someone recommended it to me in high school and have been meaning to get around to it ever since, but I’m also a little afraid of it! I’ll be interested in hearing your thoughts on Brave New World when you’re finished with it! I will likely be posting a review when I get done. 🙂 I’m having to read it at a slower pace than I would like because I have so much *other* reading, and at the same time I have set amounts of chapters to get through before each class. Argh. I already have so many ideas for propaganda posters for the book! I hope I can pull them off in a passable level of skill, haha.